First, you are NOT controlling the Ninja Cat directly – he decides where to go. Really, no use in pressing arrows or WASD. There’s no direct jumping or shooting either :) Ninja Cat moves on a path, and you rarely have the chance to change it – see junctions later on. Your aim is to kill dinosaurs. Type the letters that appear under them, to throw shurikens. 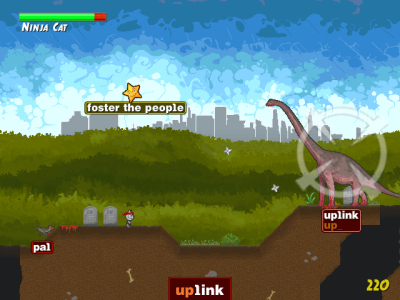 The word you need to type is visible under the dinosuar AND at the bottom of screen. After killing you’ll see how much points you’ve made on a flying numbers. When typing, only correct letters will be entered. Letter case doesn’t matter, so that ninja = NINJA. Also you don’t have to press Enter to finish a word. Watch your health meter - it’s in the top left corner. In the bottom right corner you can see a score counter. in a row: evey time you kill another in a short timeframe, combo meter increases. The higher the combo, the more points. You can see it in the bottom right corner of screen.